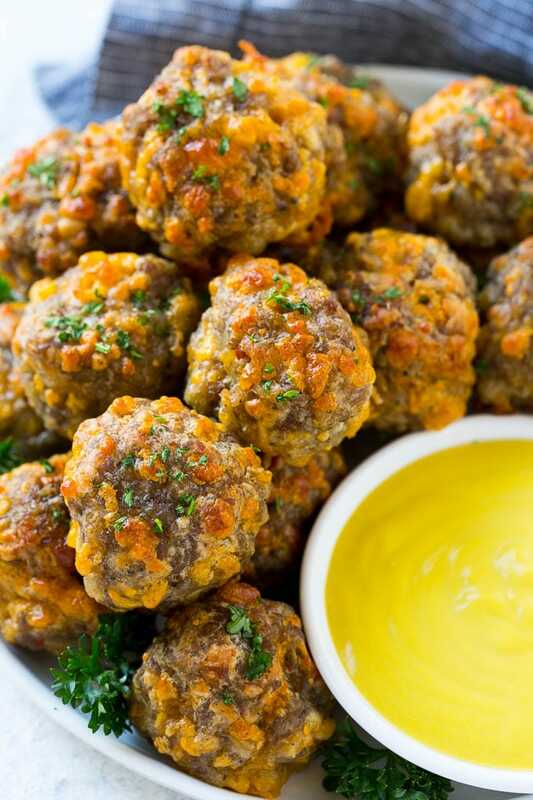 These easy sausage cheese balls are the perfect appetizer, they’re packed full of savory flavor! 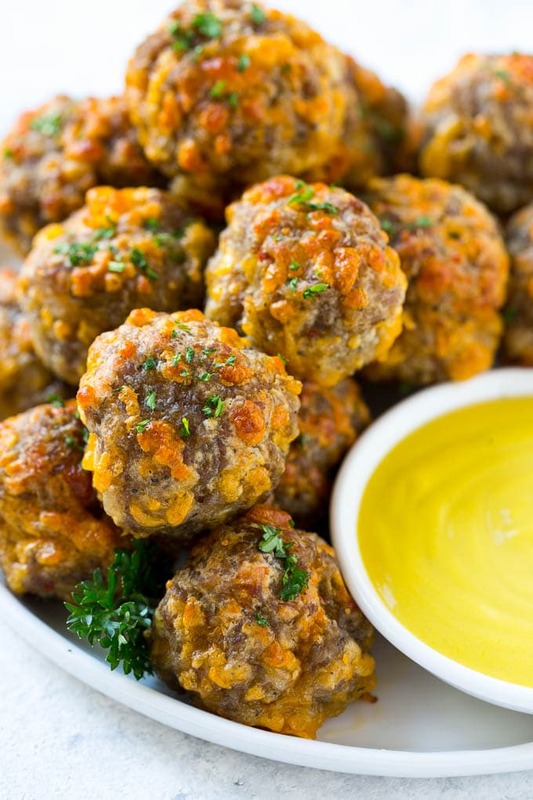 Try serving bisquick sausage balls at your next party! 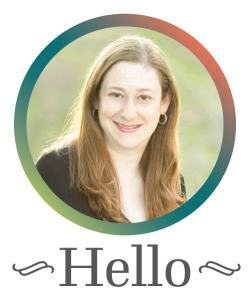 We’re heading into holiday party season and I realized that this site doesn’t have a ton of appetizer recipes. I’ve got plenty of dips, but not a whole lot of finger food variety. I’m here to change that with these easy sausage cheese balls. This recipe couldn’t be any easier and it’s meant to serve a crowd. 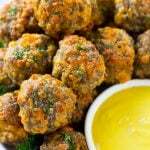 These bisquick sausage balls will be the first thing to disappear off the food table, they’re that good! The primary ingredients in this recipe are sausage, baking mix (aka Bisquick) and plenty of cheese. These ingredients are mixed together with some seasonings and rolled into balls. All you have to do from there is bake them and serve. Doesn’t get any simpler than that! These sausage cheese balls are made with pork breakfast sausage, it comes in rolls near the bacon at the grocery store. Now I’m sure a lot of you are going to ask if this recipe can be made with turkey sausage. I personally have never tried it that way, but you’re welcome to experiment! You could also use a different type of cheese if you’re not a cheddar fan, Monterey Jack would be a nice substitution. When you bake your sausage balls, make sure that you use a rimmed baking sheet. The sausage does let off a small amount of grease as it bakes, and you need a rimmed pan to make sure the grease doesn’t spill into your oven. And can I just tell you how good these smell while they’re baking?! You can garnish your sausage cheese balls with parsley if you like, but that’s totally optional. I just like to add a bit of color to what is otherwise a brown dish! 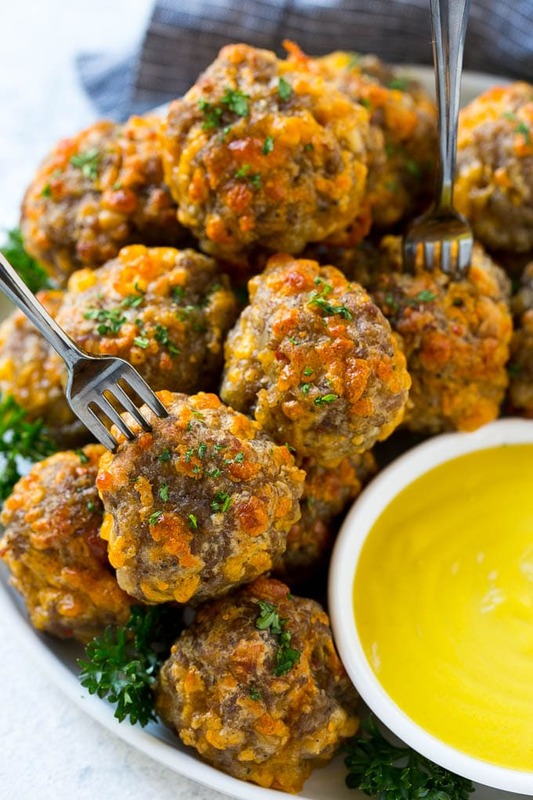 Sausage balls go great with dipping sauces like honey mustard, or you can simply serve them as-is with some toothpicks or cocktail forks for serving. 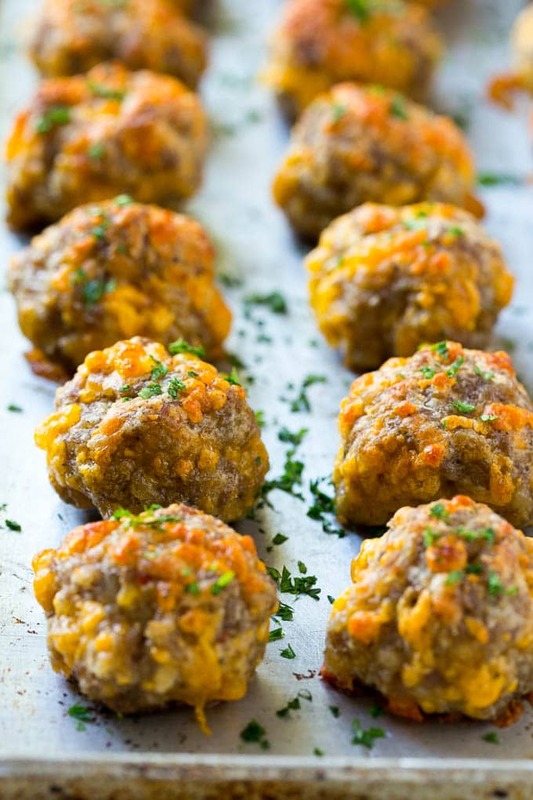 These sausage cheese balls are definitely going on my Thanksgiving appetizer menu, you can’t stop at just one! These easy sausage cheese balls are the perfect party appetizer, they're packed full of savory flavor! Preheat the oven to 375 degrees. Coat a rimmed sheet pan with cooking spray. Place the sausage, baking mix, cheese, onion, garlic powder, milk and black pepper in a bowl; stir until thoroughly combined. A stand mixers works great for this! Roll the meat mixture into 1 inch balls and place on the baking sheet. Bake for 20-25 minutes or until browned. Sprinkle with parsley if desired and serve. My husband loves these and wants them for New Years Day TV watching! I am wondering if these could be rolled ahead and frozen before baking? I’d probably bake them first, then freeze, thaw and warm back up! Yes they can. I just did it. Much easier if you mix baking mix thoroughly into sausage before adding cheese. I use 1 lb sausage to 2 cups baking mix and 1 C sharp cheddar. Roll to walnut size. Baked for 25 min.